Introspection mirror – Metropolitan Police, London. | the creative bazaar. Introspection mirror – Metropolitan Police, London. The challenge: The ugly scenes of violence had spread across the length and breadth of the capital in August 2011. Although raised the number of the police, they could not manage to stop the spread of rioting and looting. Who can stop the riots? 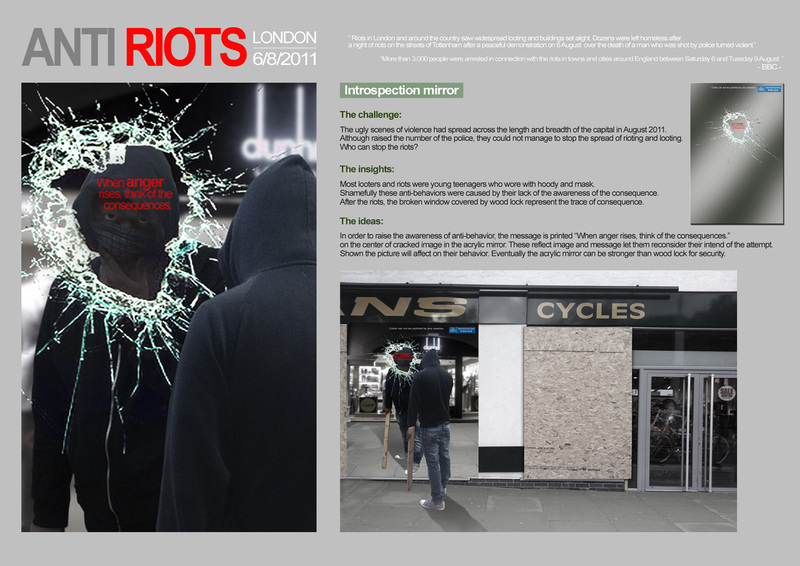 The insights: Most looters and riots were young teenagers who wore with hoody and mask. Shamefully these anti-behaviours were caused by their lack of the awareness of the consequence. After the riots, the broken window covered by wood lock represent the trace of consequence. The ideas: In order to raise the awareness of anti-behaviour, the message is printed “When anger rises, think of the consequences.” on the center of cracked image in the acrylic mirror. These reflect image and message let them reconsider their intend of the attempt. Shown the picture will affect on their behaviour. Eventually the acrylic mirror can be stronger than wood lock for security.